Posts on Local Area Exploration, Investigation and Community Building. Once weekly. You may have noticed my little side project: The Dovercourt Park Community Association. Or at least, I hope you have, and I hope you’re interested in partnering up with us! Today, I’m walking around the area, starting at Dovercourt Park and walking to our boundaries while chatting about community development, our history, and our future with some local community members. It’s fitting that a farm is now a farmer’s market. I’ve been talking about, and planning for, a different walk all week – a “Weed Walk” (far lamer than it sounds) where we walk about an urban area identifying edible, ingestible, drinkable plant life. After gardening for the last month and learning to identify the plants I grow from seed, I thought it would be lovely, forgetting that my sister – an amateur urban farmer, landscaper, florist, and general hippie – would be a great guide along this trip. As it’s too late to invite her for today, I’m pushing a Weed Walk until later. Instead: Downsview. Downsview was originally John Perkins Bull’s farm. 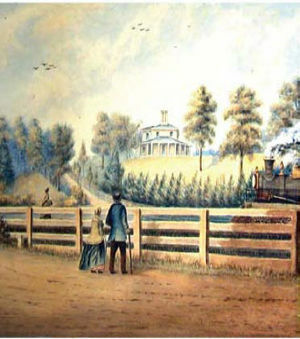 Bull, a Justice of the Peace who settled in this area around 1842, named his farm “Downs View” as his property was situated on one of the highest elevations in Toronto. [This does not bode well for our 50+ minute bike ride to the flea market, but coming home, I anticipate hitting top speed.] Bull who balanced being a centre of justice with farming, included in the basement of his farm house built a courtroom addition and a jail. I’m sure they’ve remodelled extensively for the Nursing Home currently occupying The John Perkins Bull house (450 Rustic Road). For 100+ years, Downview was its own self-sustaining area, with large post-WWII subdivisions, beautifully built churches, and lovely schools. In 1928 De Havilland Aircraft Company, followed by The Canadian Armed Forces set up military bases during World War Two. Following the end of the Cold War the land was transformed into an urban park known as Downsview Park. Today, we’re taking a tour of the over 600 friendly vendors of the Downsview Farmer’s Market offering unique merchandise from around the world. I’m shocked we haven’t gone before, but I can only assume it’s because it’s so far without a car. Welp, After conquering the North for Torottawalk and Jane’s Walk, we’re pumped to head out on bikes and find bargains in consumer electronics, fashion clothing, jewellery, home furnishings, cosmetics, housewares, food produce and Downsview’s antique market.